This entry was posted on February 7, 2015, 20:43 and is filed under Uncategorized. You can follow any responses to this entry through RSS 2.0. You can leave a response, or trackback from your own site. Couldn’t the stories of the Orisha be written in a Thor-like manner? 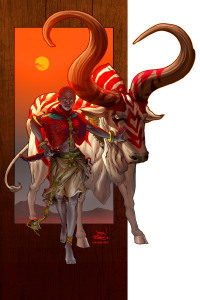 Eshu is comparable to Loki and I’m sure there are numerous thunder gods.